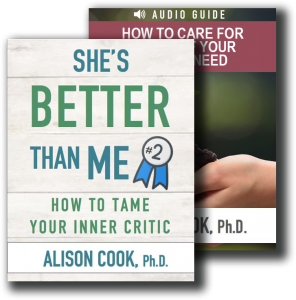 Three Steps to Healing Painful Emotions - Alison Cook, Ph.D. The first step to healing painful emotions is to focus on them. This may sound counter-intuitive, but it’s true. I didn’t really learn how to focus on and heal painful emotions until I was well into adulthood. It’s not that I didn’t have painful emotions, don’t get me wrong! It’s just that I was adept at pushing them away. The problem is is that when you neglect your painful emotions they tend to either 1.) come out sideways and hurt others or 2.) ambush you with much more intensity than if you’d just paid attention to them in the first place. When you ignore or deny your emotions, they hide away outside of your conscious awareness—waiting for that moment of vulnerability when they can make themselves known. For example, denied anger tends to come out in rude or snarky comments, sarcastic remarks, or petty negativity. And none of that leads to peace in your internal or external world. Wouldn’t it be much easier simply to face your feeling: “I’m so angry at that person!” But often we’re afraid of the power of our emotions, or we don’t know what to do with them. So instead of focusing on them and naming them for what they are, we find all sorts of creative ways to talk ourselves out of them. “I’m not angry at all,” we tell ourselves, even as the denied part of us seethes on the inside. Sometimes denied emotions ambush you with a complete hijacking. That was my experience. For years, I denied loneliness, sorrow, anger, and even fear. I was really good at telling myself and others that I was pretty much always “just fine.” But one day, all those walled off emotions erupted and came flooding over me. I had to learn how to take them out one by one and get to know them. Over time, I was able to heal these painful emotions and hep them become my allies. Loneliness is a cue to cultivate connection with others; sorrow helps me slow down and care for a grieving part of my soul; anger is a warning that I may need to set some boundaries, and fear helps me stay humble and dependent on God. The secret to healing your painful emotions is to pay attention to them—not shove them aside. 1.) Focus on the emotion. Focusing on the emotion helps you to differentiate from it. When you can name an emotion for what it is, you gain distance from it. Simply acknowledging the fact of what you feel—”I feel angry” or “I feel sad”—soothes the brain’s limbic system and helps you gain access to other regions of the brain (Dan Siegel, Mindsight). 2.) Get curious about the emotion. When you notice a strong or painful feeling, get curious about it. In doing so, you’re moving into a position of self-acceptance. Instead of judging yourself for having the emotion, you accept it for what it is and decide to learn more about it. Criticizing yourself or beating yourself up doesn’t heal your emotions—in fact, it heightens the tension and turmoil you feel inside! 3.) Invite Jesus to draw near. We are emotional, thinking, and spiritual beings. Access the tremendous spiritual resources at your disposal by inviting God to draw near you in your experience of pain, fear, or anger. He may not magically take the feeling away. . . but he will help you gain perspective so that you can act calmly and intentionally on behalf of the emotion instead of reacting from it. Understanding and befriending your emotions brings a deep-down, grounded kind of healing. It’s the kind of health that comes from knowing you are in charge of your emotions, not the other way around. As you practice following these three steps—what we call taking a You-Turn—you’ll learn to calm yourself when overtaken by a painful or troubling emotion. You’ll gain compassion for yourself and learn how to respond intentionally to a difficult situation. You’ll learn how to advocate effectively on behalf of yourself and others. . . without doing harm.